When our French teacher Cloe asked us to form groups based on our interests, I picked Cinema over Cuisine and Theatre. The choice somehow looked the most apparent one. Seven of us in the group began to discuss our project. It started off with directing a short feature film, then it turned into a documentary on the influences of French cinema on society and vice versa. Every Saturday we would be lost in defining our goal. Then Cloe came to our help. She made us realize that the subject we had chosen was vast and could not be achieved in 2 months. So she suggested that we concentrate on one director instead and may be his works during a crucial phase of his career. Not being very knowledgeable about the history of French cinema, we had no option but pick the first name she mentioned - Jean Cocteau. But finally, thanks to her, our project for the first time, looked possible. 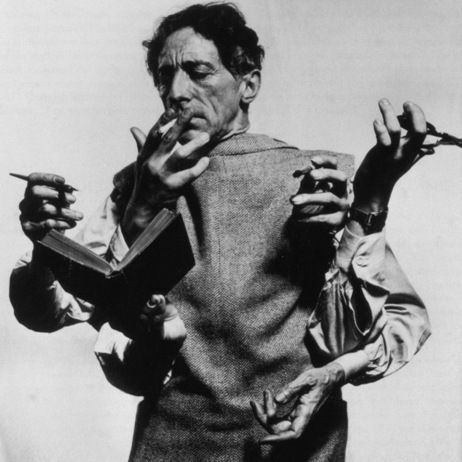 We decided to split the work of watching every movie directed by Cocteau during the world war two and little after. With two of the team members leaving and two other being irregular, it was too much of a task for the remaining three. Considering the fact that time was running out on us, we reduced the scope even further. 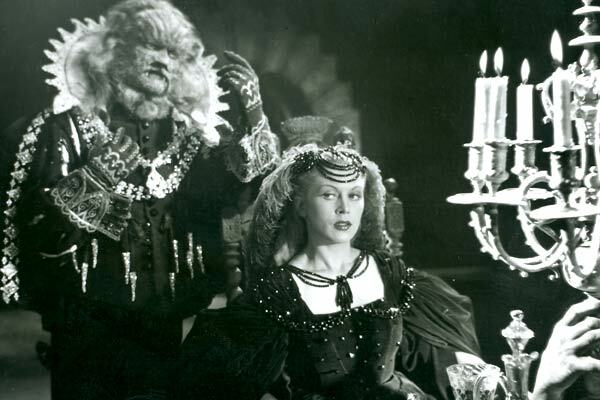 We zeroed in on one of his finest films - La Belle et la Bête. The whole process of making this documentary was fun and tiring at the same time.. We watched the film, formed our opinions and made a plan of the script. But every time Cloe would visit us she would leave us with a new thought, a new perspective towards Cocteau's work that would make us feel so primitive. Her way of looking at things was so different from that of ours. She would always invoke fresh thoughts and perspective in us by asking - "Why do you think Cocteau picked this particular story soon after the war? ", "What does it signify? ", "Why does Belle wear black in this scene?". One of the best example of cultural difference we had was her way of looking at Cocteau's Opium addiction - "May be his addiction to drugs boosted his creative abilities", she said while few Indian eyebrows raised. Considering that some, if not all of his works are surrealistic, influence of one on the other could be highly possible. There was always something interesting to learn, like about sixteenth century Dutch costume used in the film, Influences of famous paintings in the lighting and settings. As much as we were excited about these new findings, we were also concerned that we were not progressing as quickly as required and the deadline was soon approaching. We finally put together our script and got it corrected. We picked the scenes we thought were relevant and made a draft film. Geetha gave the voice over for the entire film. Our draft was what it is meant to be and thus had several corrections in terms of scenes we had chosen, in pronunciation and tone and editing. But making that draft was the best thing we did in days, as it gave us an idea of to where we were heading. Until then I was skeptical about the project but the draft boosted my hope. Thanks to iMovies in my macbook, I was able to quickly sew the scenes together easily with interesting transition effects. Then came the final days of our project. I do not remember working this rigorously even for my college project. The final video was ready and now it was time to record the voice. We decided to find a quite room in AFB that could prevent noises from traffic. But unfortunately every room was noisier than the other. We almost completed one full set of recording when we realized that there was some acoustic issue in the room and the voice sounded very low. So finally, frustrated and irritated we began looking for a quite place in the school. And then the idea struck - the car! It was perfect. Inside the car, it was quieter than any place we could go to that day. With more work on iMovies we were finally done. It was awesome how we all got together on this project. Geetha, Ashish, Harsha and me. It was interesting to discuss our new findings and sometimes also the frustrations about the project. But in the end, it was a work that we shall never forget. And all the credit goes to Prof Cloe who made this experience of French learning so memorable to us. Through this project, not only did she introduce us to French cinema but also made us dive deep into French culture, art and music..
On the 23rd of July, when we showed the movie on big screen to a decent crowd at AFB, we were happy to see what all our handwork had turned into. But most notably for me, this experience had changed the way I watch movies. I no more watch a film just for its story and acting but I have begun to analyse why the director choose to represent a scene in a certain way and what were the influences. And interestingly this new perspective has made me enjoy every film that I watch in a way that was unknown to me before. I wanted to thank my French Professor Cloé for all the good things she had taught us and how she has inspired us and opened a door towards a new style of thinking, teaching and learning. So after giving it a lot of thought, I decided to gift her one of my poems that I had written a long time back and which I consider to be one of my best. 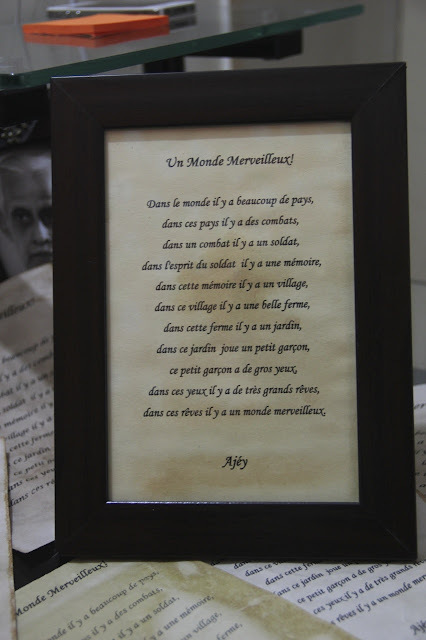 But simply framing a poem did not make the gift special. So I started thinking of an idea to make it more creative and convert it into a work of art. Making the paper look antique was an immediate idea that occurred to me. In search of methods to realise my idea, I browsed through several websites and videos. It was interesting to notice so many people who had tried it and wanted to share their learnings. 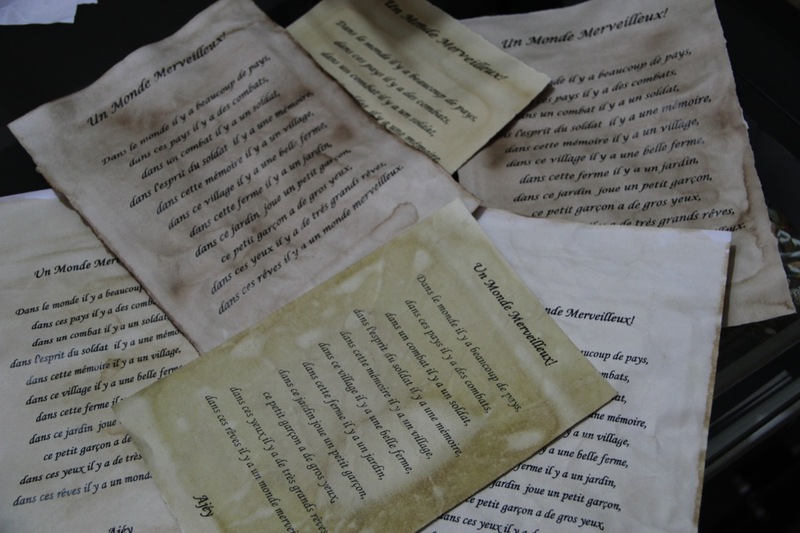 So I began taking prints of the poem in different types of paper and fonts, dipped them in coffee and tea before baking it to an ideal temperature and time. I played a lot with different concentrations of tea and coffee and also with the temperatures. Place the paper in a baking tray and pour tea. Bake at a lower temperature and for less time, else the paper looks charred. After many such iterations, I finally found my best. I used a thicker sheet of paper. For an interesting effect, you can also crumble the paper first or burn the sides after baking. Below is the translation of the poem in English. in those dreams is a wonderful world. "Was the movie inspiring?" Many of my colleagues asked me after we had watched "Baagh Milkha Baagh" together along with rest of the office. HR considered this outing as a team building activity and a way to motivate the employees. It indeed was a good team building initiative. But I was not able to answer the question immediately, like I never am. To me, an opinion must be a result of well contemplated process. So I only said what I could say without a second thought - "I loved the making." I liked how the story switched between past and present; I liked how the camera captured some minor details like the dust raised by an athlete's foot as he ran; symbolism behind rain drops filling up a bucket of sweat relating to hard work. However, I was also clear that I hated the way movie promoted hatred. It glorified the misery of partition and amplified the enmity between two countries in a time where each of them have to learn to move on by putting away the differences. I disliked the fact that the story tried to justify every mistake of Milkha's life without accepting the fact that people need not be plain black or white. But having said all this, I was still aware of the fact that I had not yet answered the question. After giving it some thought, I realised how sportsmen never inspire me. For instance in the movie, Milkha first ran for his life, then he ran for a glass of milk, then for a team India coat, then to defeat his evil opponents and then to prove himself worthy and then to break a record. And if I relate this to other sportsmen, they all strive towards one common goal - Victory. For them, if you do not win, you lose. To me, sports is not the best example of passion other than that for victory. That said, it does not mean that I disrespect them but all I want to say is that these stories do not inspire me. Sports always promotes competition, determination, dedication and glorifies a message that winning is the only ultimate goal. If a sportsman denies this, he is not only being unfaithful to himself but also to his team and his country. However, it also made me think of a few sports movies that I have liked and even found inspiring. For example, "Chak de India". Yet, it is not the game or the team's victory that inspires me in the movie but it is how a coach or a leader can unite a team with conflicts and make them strive towards a common goal. I enjoyed "Invictus", but it is not how they play rugby that motivates me but it is a president's vision to unite his country through sports. I loved "The blind side" not because of the sportsman but for the boldness of a mother who adopts a kid from a suburb and provides him a better life. On the other hand, there are several artists and creative people who inspire me. A true artist does not create his work to prove anything. It is simply a work of creativity; to express his state of mind or his thoughts. When I say artists, I mean that in a much broader sense, such as a musician, painter, film maker, poet or a writer provided they are not focusing on encashing a market like a successful entrepreneur who has masterfully learnt his way to sell his idea and who can be an inspiration only to those who think success is all about earning more money. Artists, their thoughts and their purpose in life is much more than just winning and making money. A teacher or an individual devoting his life towards service of the society is inspiring for me as he lives for a greater mission. So that is my answer to the question and I think I am pretty clear about it.